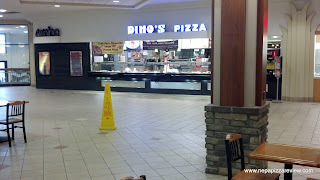 I was running a few errands around the Wyoming Valley Mall and realized that it offered a pizza in the food court that I had not yet reviewed, so even though I wasn't hungry, I thought it was important to once again put my health on the line to inform YOU - the readers about how the pizza is at Dino's (in the food court, not to be confused with the Dino's by JC Penney - different owner!). 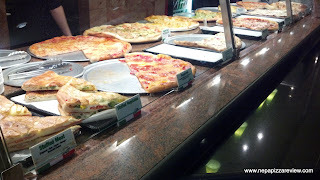 First of all, Dino's has a very impressive storefront with a robust display of gourmet pizzas, salad, pasta, and other Italian cuisine offerings so there is much to pick from besides just pizza. For the record, the kitchen was immaculate, everything looked delicious, and the portions appeared to be huge based on the plates I saw customers lugging to their tables. Although everything on the menu looked good, I was here with a purpose - to try the New York Style pizza so I ordered up one and briefly waited for my slice. Usually a short wait is a good thing, but when it's my slice that's only being reheated for about 45 seconds, it is not. When the slice was handed to me, my first impression was that it was gigantic, and my second impression was this was not hot at all. 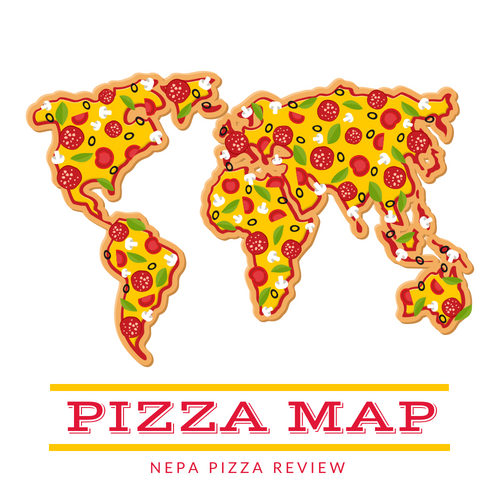 Since it's my job to inform you as to the pizza and service that I receive, and not to request a do-over, I took my lukewarm slice to my table to review. I detected a slight buttery smell as I raised the massive slice to my mouth to take a bite. I didn't detect a buttery taste, but perhaps it was my sense of smell picking up on the greasy cheese. There was a generous amount of cheese on top, but the flavor was flat to me mainly because it was not reheated properly, but that's the risk I took ordering a single slice. The sauce is your basic crushed tomato sauce which is fairly smooth with only subtle chunks. I liked the consistency, but the sauce was overseasoned and the high amount of oregano threw the whole pizza out of balance. Don't get me wrong, I like oregano, and the flavors were not bad, but they weren't working together in harmony. I always prefer a higher quality tomato with less seasoning over an inferior tomato that is heavily seasoned. The thing I disliked most about this pizza was the crust. 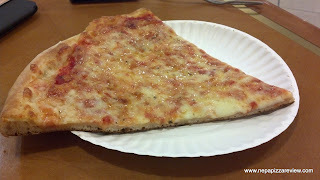 It's a relatively thick crust for a New York Style pizza, and the dough was only cooked through about 75% of the way creating a prevalent doughy flavor throughout which really weighed on my taste buds. Overall, I'd have to say that this slice is your average "Mall Pizza" which had just a little bit more potential if it were reheated properly, but given the ingredients in the mix, I don't think it would wow me even if cooked to perfection. 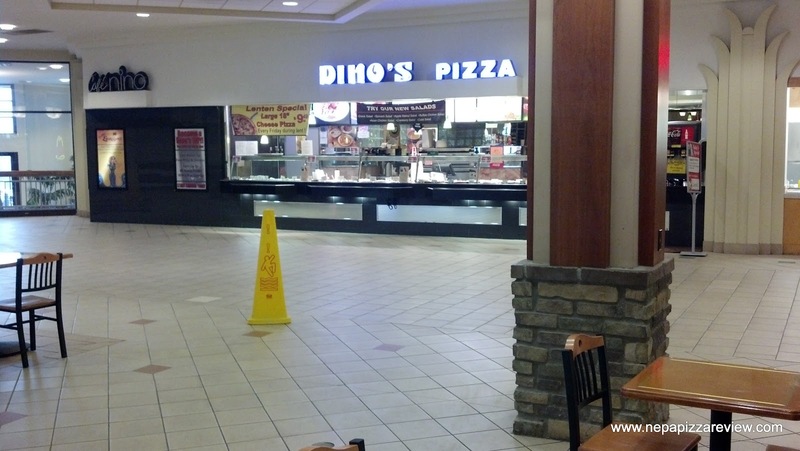 I do believe that this pizza has mass appeal and Dino's has achieved exactly what it sets out to do - provide a generous slice at a reasonable price. If you are in the food court looking for a quick slice, this is a safe bet that will fill you up. You may also want to consider some of the other tasty looking menu items they offer. The impressive storefront, longstanding business, and usual line of customers inspires confidence that you will be satisfied with the food here.